An episode that illustrates exactly why I am madly in love with my son. - Laughs! Thrills! Pathos! An episode that illustrates exactly why I am madly in love with my son. Matei has a motorbike. You can charge it with electricity and he rides it until one of them falls over. It is his pride and joy. Matei has friends in the neighberhood. In general he is quite keen on the company of other children, except that they keep asking to ride his motorbike, and he keeps getting told that he has to share, so he does. Stands there watching them take turns riding HIS MOTORBIKE while looking like he's on the verge of getting ulcers. On the other hand, he is nothing if not cunning and keen on using problem-solving skills, which brings us to this. 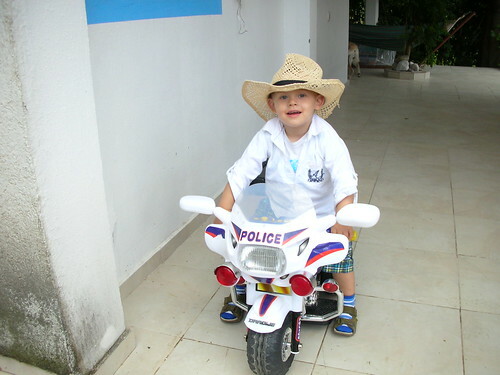 Matei: Mummy, I took the seat off my motorbike. And then I took out the wires. And then I replaced the seat. Matei: Then I checked to see if it was working, and saw that it wasn't working. So when my friends came over and asked if they could ride it, I said "Yes, of course!" Me: And why did you say that? Matei: Because I knew it didn't work. That hat looks really good on him, by the way. Oh my, that's clever! A nice work around that ensures noone has to be rude or feel put out. I thought Matei should be saying "You will respect my authority!" Emma wondered if he was considering a career in politics?